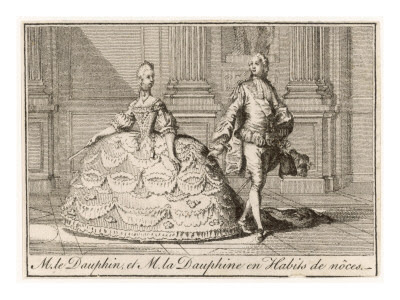 On 14th May 1770, about a month after their proxy wedding, the new Dauphine Marie Antoinette finally met her husband, Louis. The meeting took place at 3 o’clock in the forest near the chateau of Compiegne (one of the favourite royal residences of King Louis XV) where the road crossed the river at the Bridge of Berne. The curious French King, rather than wait for the young girl to arrive, had decided to ride out and meet her. He was accompanied by his grandson Louis and three of his daughters. responsible for my happiness!” “And that of France,” the Duc replied. Then, the French royal family alighted from their carriage too, and Marie Antoinette was duly presented to them by the Duc de Croÿ, First Gentleman of the Bedchamber. Straight away, Marie Antoinette fell on her knees in front of the King. Louis XV was impressed with this charming, “spontaneous and a little childish” young girl and touched by her gesture and the respect she showed him (although he was somewhat disappointed at her small bosom!). At his side stood the heavily built, heavily lidded and dark haired young Dauphin Louis. He embraced his wife, but no records remain of his first impressions of Marie Antoinette or about his feelings about this encounter. In his journal, he simply and briefly wrote: “Meeting with Madame la Dauphine”. It’s likely that Louis felt shy and uncomfortable. Although he wasn’t as bad looking as people generally believe, he was reserved, taciturn and awkward, and walked badly. And now he was married to this lively, dazzling and beautiful young girl who had the ability to charm everyone she met, loved dancing and parties and moved with grace. They were very different and it would have been normal for Louis to feel somewhat intimidated in her presence. That night, back at the château of Compiègne, Marie Antoinette was introduced to the Princes and Princesses of the Blood, including the libertine Philippe, the future Duc D’Orleans, who would, in a not-too-distant future, vote for the execution of Louis at his trial, and Marie Thérèse de Savoie-Carignan, Princess de Lamballe, with whom Marie Antoinette would strike up a close friendship that would last until the tragic death of the widowed Princess during the French Revolution.